These two issues are just the tip of Belgium’s anti-Semitic iceberg. The Chief Rabbi of Brussels, Albert Guigui, no longer wears a kippa in public for fear of violence. In 2001 he was attacked by five North African youngsters who cursed him and spat in his face. One even kicked him in the face. Lord, master of worlds, fill with fear the hearts of the Zionist oppressors … Lord, fill their hearts with fear. Lord, make the earth tremble beneath their feet. Lord, make the blood of the martyrs a weapon under the feet of the Zionist oppressors, and may this blood ignite a fire that burns them and start a wind that eviscerates them. […] O Lord, tear them down. When the ten-year-old video came to light, Toujgani apologized. 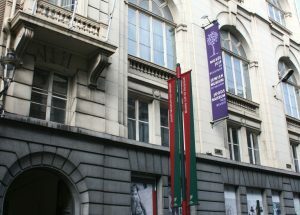 Toujgani is expected to be the next president of the conference of Belgian imams. When former socialist PM Elio Di Rupo attacked the way Belgium was governed, he said, “It’s a Belgium of Antwerp diamond dealers that we have today.” Though Jewish participation in the Antwerp diamond industry has greatly declined, its image remains largely Jewish. One might consider Di Rupo’s expression a paraphrasing of the classic European anti-Semitic deployment of the name Rothschild, which is used as code to symbolize greedy capitalists. Di Rupo wrote on Twitter after the Charlie Hebdo murders and the murder of four Jews in a Paris supermarket: “I am Charlie. I am Jewish. I am Palestinian.” After Gilad Shalit was kidnapped in 2006, a press statement was issued by Di Rupo saying that Israel would use it as a pretext to start a war with Lebanon. A number of police officers who had served under a Brussels police commissioner complained about the latter’s alleged hate speech in recent years against gays, foreigners, and Jews. Two policemen with Jewish roots were called to his office and forced to listen to Nazi songs. The commissioner in question has also denied the Holocaust. A university lecturer and senior executive of the major Belgian ACOD Trade Union – the General Center of Public Services – wrote that Israel poisons Palestinians and kills their children to use their organs. Andre Gantman, a former Jewish municipal councilor in Antwerp, says that when he spoke in 2009 at the University of Antwerp, a young Muslim dressed in white asked him, “Is there human blood in your veins?” Gantman said the man’s attempts to dehumanize him reminded him of Nazi ideology. Even schoolbooks in Belgium carry anti-Israeli political bias. A Dutch-language sixth-grade textbook instructed students to read sentences aloud with correct intonation. One sentence read, “When a Palestinian child in Jerusalem saw a Jewish soldier arriving, he shrank in fear.” Sometimes textbooks contain anti-Semitic ideas. An illustration in the 2016 geography textbook Polaris GO!3 for Flemish-speaking high school students depicts a beefy Orthodox Jew lolling in an overflowing bathtub, while a Palestinian woman can barely fill her bucket. British filmmaker Ken Loach received an honorary doctorate from the Dutch-speaking Free University of Brussels. He supports the boycott of Israel and has likened Israel’s actions to those of Nazi Germany. A former socialist Euro-parliamentarian, Veronique de Keyser, once said that she would like to strangle the Israeli ambassador if he discusses the country’s security issues with her. Several studies on anti-Semitism among schoolchildren in Europe were undertaken by a Belgian sociologist, Mark Elchardus. He found that in Dutch-speaking schools in Brussels as well as in the Flemish towns of Antwerp and Ghent, 50% of Muslim pupils had anti-Semitic attitudes. Among other pupils it was only 10%. A Muslim organization complained about Elchardus’s study at the Center for Equal Chances and the Fight against Anti-Semitism. While the complaint should have been dismissed out of hand, Elchardus said it took legal experts a month to conclude that it was a false accusation. The above array of misdemeanors is but a small selection of incidents of anti-Semitism and anti-Israelism occurring in Belgium. In the past, the country’s leaders have felt the need to apply universal jurisdiction as far as crimes against humanity, war crimes, and genocide were concerned. Any private citizen anywhere in the world could submit a complaint against anyone to Belgian courts, which could then decide on criminal prosecution. The complaint did not have to have any connection to Belgium. For a country with perhaps the most horrible colonial past in the world, this seems absurd. The opportunity was taken up by several survivors and family members of the victims of the murders of hundreds of Palestinians in the Sabra and Shatila refugee camps in Lebanon in 1982. Their complaint was not against any known member of the Lebanese Christian militias that had actually committed the murders. Instead, it targeted Israeli PM Ariel Sharon and two Israeli generals. The Belgian investigating judge decided there was no basis for prosecution, but the Belgian court decided to prosecute anyway. Thereafter, under Belgium’s universal law, a complaint was brought against US President George Bush, Sr., Secretary of State Colin Powell, and retired general Norman Schwarzkopf for their roles in the 1991 Gulf War. The US told Belgium that if the process went ahead, NATO headquarters would be moved out of Brussels. The Belgian parliament responded by changing the law, and the Sharon process came to an end.